Zip: Our amazing Treetop Canopy Zipline Tour begins at the top of the amazing Ka’a’awa Valley with 7 exciting tandem sections, 2 suspension bridges (don’t worry, you’re clipped in across the bridges!) and 3 mini-hiking nature trails about 5 minutes in length. If your surroundings look familiar, it’s probably because you’ve seen Ka’a’awa Valley in one of many movies… like Jurassic World… that have been filmed here over the years. No Experience Required! Its easy and fun … even for first time “zip liners”. No need for gloves to stop you … we use an automatic braking system so you don’t have to do a thing … we’ll stop you automatically at the end of each line. 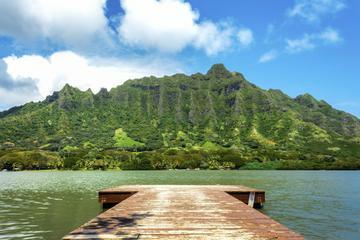 Come and experience the amazing beauty of Kualoa on our Zipline Adventure! Dip: Secret Island Beach is an ideal place to relax and spend the day with lots of water sports equipment to use at your leisure. Package includes our signature “all-you-can-eat” Ranch buffet lunch. Great combination of relaxation with adventure. I love doing zipline but the jurassic valley is indeed something else. I enjoyed the hammocks and the sound of the ocean. We went on a sunny day and the feeling of being down a palm tree was just awesome. .The guides for the zipline tours were simply the best. Highly recommended!